Operators: Izvekov V., Kuzminskiy S., Filatov I. 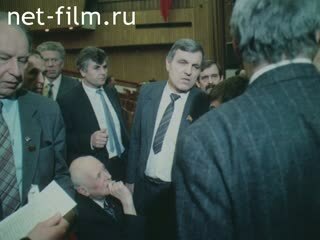 The discussion about power duriong the three Congresses of the USSR deputies. 3rd Congress of People's Deputies in the Kremlin Palace of Congresses: exit Bureau, the deputies talking in the hall - different. Appears MPs: artist and physician B. Dikul, rector of History and Archives Institute YN Afanasiev (synchronously), Alekseev (synchronously), Avaliani (synchronously). Mikhail Gorbachev at the Congress. Performing deputies: VA Medvedev (synchronously), NI Ryzhkov, the Minister of Internal Affairs of the USSR VV Bakatin, mechanic Adamovich (synchronously). Mikhail Gorbachev speaks to deputies in the courtroom. GDR. Former secretary of the SED, Erich Honecker and his wife - kr., Wed. Youth destroys the Berlin Wall - Various. Election of the first Soviet president: polling place in St.
George Hall of the Kremlin. People on the street are interviewed about the election (synchronous) - cr., Wed.
Newspapers materials on the election - kr. Says the chairman of the Counting Commission deputy Osip'yan. Passes Mikhail Gorbachev, who was elected the first president of the USSR - Wed, cr. MPs on the sidelines - Various. 1st Congress of People's Deputies of the USSR: Boris N. Yeltsin, gives interviews (synchronously). Deputy Speaker VI Karasev (synchronously), the presiding officer interrupts him. Various plans listening to deputies. Says First Secretary of the Leningrad Party Committee Gidaspov (synchronously). MPs on the sidelines - Society. Andrei Sakharov talked with other members - kr. 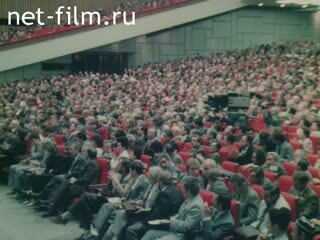 Sakharov speaks at the Congress of People's Deputies (synchronously). 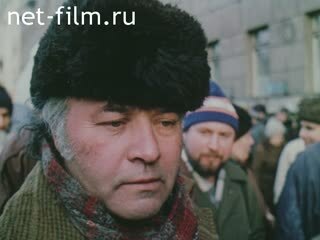 The funeral of Andrei Sakharov: the people in the square, the color of - different. GDR: people break the Berlin Wall. People on the street - different. NI Ryzhkov, speaking at the Congress of People's Deputies (synchronously). MPs on the sidelines - kr. A writer, editor in chief of Ogonyok Vitaly Korotich gives interviews (synchronously). Deputy Speaker Yaroshenko (synchronously) - kr. Deputies in the hall - Society. Director of the Institute of USA and Canada academician G. Arbatov favor (synchronously). The deputies applauded - Society. Performing deputies: AA Sobchak, a journalist Yuri Chernenko (synchronously), NI Ryzhkov, and others. People on the street - MS., CU. The queues at the store - CU., MS.
Deputies in the hall - different. Electronic display in the hall - MS.
Azerbaijan: a house, battered bullets are corpses - MS., PNRM. Barricade of buses - LS. The people in the area - LS. She stands on a street rally - LS. People with newspapers - CU. Trucks and tanks on the streets - MS., LS. 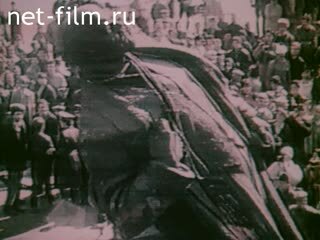 Removal of the monument to Lenin - different. Congress of Deputies: serves military prosecutor Katusev (report about the tragedy in Tbilisi). Crying delegate from Georgia - CU. Georgian delegation leaves the room - LS., CU. Gorbachev said the deputies - MS. Cost picket Meskhetian Turks - MS., PNRM. ; Said one (synchronous) - CU. Priest with CU.estom - MS.
Monument to Lenin - different. "Baltic Chain": people standing hand in hand - MS., PNRM. Mikhail Gorbachev speaks to delegates Lithuania (synchronously) - MS.
Lithuanian representative, deputy Landsbergis speaking at the first Congress of Deputies (synchronously). Mikhail Gorbachev among the delegates of Lithuania, said (synchronous) - cf. Deputies Kogan and Maslyukov said the situation in Lithuania (synchronously). Mikhail Gorbachev gives the oath of (simultaneous) - kr. GDR: open gate - Wed, people are fleeing to the West Berlin - kr. The revolution in Romania: the people in the area - commonly. Moscow: demonstration on Red Square - commonly., Wed.